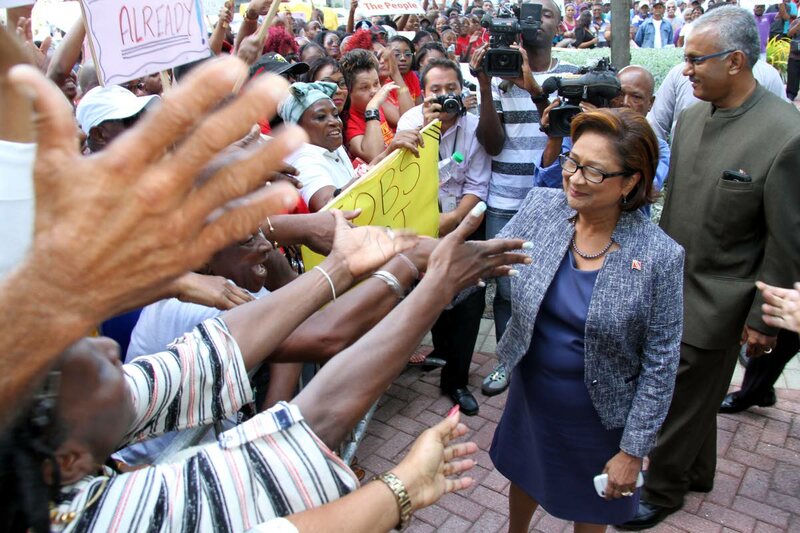 Opposition Leader Kamla Persad-Bissessar yesterday called on members of various trade unions to let their voices be heard and to speak for themselves as they continued their protest in front of Parliament, at the International Waterfront in Port of Spain yesterday. During a break in a sitting of the Lower House yesterday, Persad-Bissessar spoke to protestors outside and expressed her support, she also assured those gathered that she would raise their issues before Parliament and said that she would appoint one of the protestors to come before the Senate and voice their concerns. President General of the National Trade Union Centre (NATUC), Michael Annissette said Government continues to neglect the plight of its citizens and expressed his full support to the cause of the demonstrators. He criticised the 2018 budget for not being inclusive to the needs of those in lower to middle income brackets. The protest which began outside the Works and Transport Building on London Street, drew over 200 demonstrators who spilled onto the road blocking the passage of both motorists and pedestrians before they relocated to the Parliament, where the protest ended. Reply to "Kamla tells protestors: We will appoint one of you"